Last year I ran the ATL 20K race for the first time, as a relay with Myriam Fentanes, Beverly Ford (now Minor), and Brian Minor each running a 5K leg. Someone recently asked "What was my most favorite race?" and definitely it was the 20K relay, due to the camaraderie of running with the team! This was also one of my best runs ever, running 3 straight sub-8 minute miles. But part of my motivation was fear of letting down my teammates! When registration for this year's race opened in early April, I wasn't able to run at all! Even so, I sent a text to Myriam, Beverly and Brian asking if they were interested in the relay - and then immediately reconsidered. That was when I soberly realized that I potentially faced a long period of physical therapy before beginning re-training to prepare for the New York City Marathon. 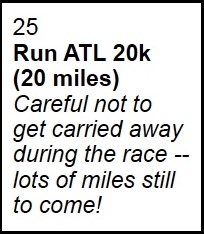 The $20 early registration fee was too good to pass up, but I committed that the 20K (12.4 miles) would be a training run, in a fun and supportive environment, instead of slogging out the miles on my own. Fortunately my recovery has gone well. My one remaining "ailment" is Achilles tendonosis, which I'm still treating with physical therapy both at the clinic and especially with the home exercises, and very careful attention to warming up and post-run stretching. The Tuesday evening track workouts with Coach Carl have resumed. I've run each of those workouts quite well, especially with pace discipline and conserving energy to complete each workout in a quality fashion. I've largely regained my cardiovascular conditioning, although I haven't really tested it in a fast race, and I don't care to try for new personal records until after the marathon. The plan for today was 20 miles, at an easy pace. I arrived at the race starting area an hour before the start, around 6 am. 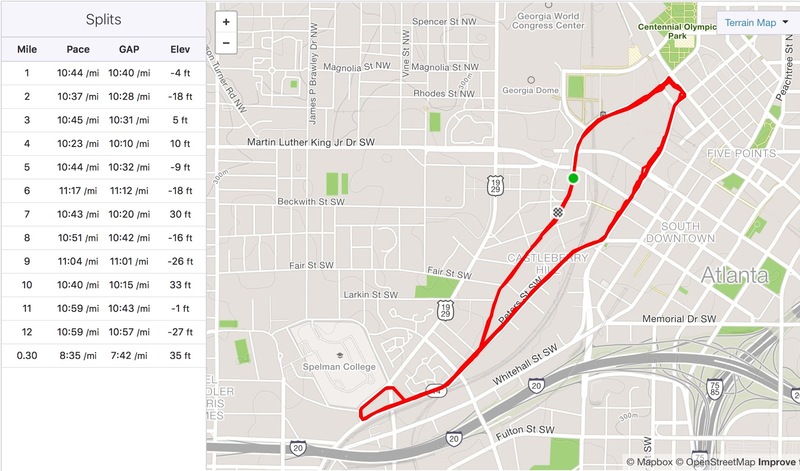 After thoroughly warming up, I ran a little more than 3 miles at an easy pace, partially on the race course as the cones were set out, and then running a few blocks to get to a bathroom stop near Centennial Olympic Park. I cut the time a little too close, leaving the bathroom at 6:52 am and then sprinting several blocks to get into the starting area at 6:58 am. Turns out I had a little more time, as the race didn't begin precisely at 7:00 am. While I was trying to ensure that I was situated with other 20K runners - and out of the way of the first wave of relay runners, Lindy Liu arrived after her own warmup, also wearing a 20K bib. Lindy is also running the New York City Marathon. When she said that she was aiming for a 10:45 min / mile pace, and running intervals, I asked to run with her, since I was planning for the same pace. Our interval strategy was a little different - she was using a 2:30 run / 0:30 walk plan, whereas I had my watch set to signal 4:30 run / 0:30 walk, and I decided to try out her plan. Tes Sobomehin Marshall gave the starting signal, and the crowd moved forward. It took a minute or so to reach the timing mat, which was about 0.2 mile north of the relay exchange area. The start was a little slow, as we had to share a wide but single lane. In fact that was great practice for imagining the start of the marathon in November. I could have pushed my way forward through the crowd, but with many miles to do, not only today but over the remaining weeks of the training program, I was satisfied to jog through slowly and enjoy the encouragement of the crowd at the relay exchange area, awaiting their runs in the second, third, or fourth legs. The temperature was wonderful, 66 deg F, without high humidity, no chance of rain, in short a rare weather gift for August in Atlanta! We settled into a comfortable pace, and after a mile or so, I checked my watch for the first time. We were right on the goal pace of 10:45! After the race, the Garmin data showed that most of our running legs were in the high 9 min / mile pace, which felt very comfortable especially with the regular walk breaks. 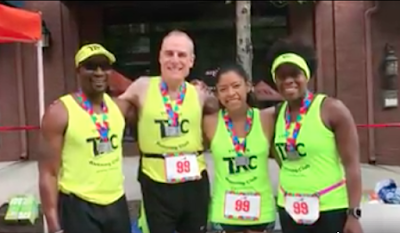 This was a pace at which Lindy and I could maintain conversation, and we enjoyed cheering on friends and other runners on the course in the out-and-back section of the race approaching and leaving the Spelman College campus. 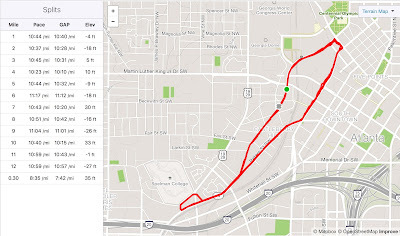 After looping back to Marietta Street in downtown Atlanta, we ran uphill (over train tracks) past Phillips Arena, then past Mercedes-Benz stadium, and approaching the relay exchange area. Lindy and I tried to stay to the right in case any relay runners came through, but I think that most and perhaps all of the runners finishing the first 5K leg had already come through - so the cheers were for those of us conserving energy for the longer distance! Music blasting, MC's dancing and exchanging high-fives as we came through, friends cheering as we came through, so much fun! Shortly after crossing the timing mat i remembered to click the lap timer on my Garmin, 10:41 min / mile pace for the first lap! The second lap went smoothly, with Lindy and I helping each other stay on pace, not too fast or too slow. Midway through our second lap, we were passed by runners that I think were on the third leg of the relay, so we tried to stay to the right side of the lane. 10:48 min / mile pace for the second lap. The number of runners diminished as we ran the third lap, as most of the 10K runners had finished. The faster runners on the last leg of their relays passed us, as did the leaders of the 20K race. As we approached the relay exchange area once more, the crowds cheered us again, friends calling out "One more lap!" and I gave a smile and two thumbs up. 10:53 min / mile pace. Yes, we had slowed down a bit, but almost imperceptibly, and were still running faster than 11 min / mile pace. Feeling good, we ran the final lap. It was pretty quiet at this stage, since no one was passing us, nor were we passing anyone, but we were definitely enjoying a good workout. Even though it was 9 am, the temperature was still pleasant. As we entered the final mile of the race, Alice Pate joined us as part of her cool-down (Alice is also in the Tuesday evening track workout group). We took one last walk break approaching the overpass outside of Phillips Arena, I started ever so subtly pushing the pace just a bit, focusing on form. Lindy kept up and seemed to be running strongly herself. We both sped up a little more as we could hear the cheers of the crowd ahead. This time we were able to move to the right side of the road as the finish area loomed ahead. We both sped up a little more (7:30 min / mile pace), practicing the finish that we hope to run in New York! As we approached the final timing mat, I took a little leap intending to jump over the timing mat - but I can't jump very well, and ended up landing on the mat. Oh well, it was funny and no harm done. Time: 2:12 and change for the race, gun time 2:13. I was a little tired and sore, not really in pain, but ... wouldn't it be nice to stop? After 1/2 mile, I had returned to the finish area, stretched and cooled down. 30 minutes later, I realized that I had let these minor, insignificant issues derail finishing my long run workout. And by now (warning: two more excuses coming!) I had changed into dry clothes, and needed to get home in time to go to an afternoon birthday party. Running is a mental exercise as much as it's a physical exercise. I ran 17 miles (16.82 to be exact) in perfect fashion for marathon training, but then failed to complete the last 5K leg to finish 20 good miles for the day. Fortunately there is enough time to get back on track, and by no means have I ruined the marathon training program. But now I need to check with (confess to) Coach Carl to get his recommendation on how (or whether) I should make modifications to make up for the short mileage today.